April 24 is National Pigs-in-a-Blanket Day. You must have tried sausages wrapped into dough and baked in the oven to golden crust. They are perfect appetizers for a party! Pigs-in-a-blanket appeared in the 1950s, when the first recipe of this appetizer was published in Betty Crocker’s Cooking for Kid book. But food historians also found another dished called pigs in blankets, that was published in 1930. It's interesting, that there were no sausages used and it comprised oysters wrapped with bacon. We think you can guess, which recipe won out. 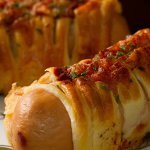 Pigs-in-a-blanket are usually made with hot dogs or cocktail frankfurter wrapped with a croissant or biscuit dough. That is how they are made in the USA. However, there are different varieties of this dish. In the United Kingdom pigs-in-a-blanket are little sausages wrapped in bacon. This dish is usually served at Christmas dinner. You can go further and wrap sausages with bacon and then with pastry dough and bake. This will make your pigs-in-a-blanket look like real little pigs!